EDT Installation – Welcome to the EMIT Technical Forum! The EDT comes with DIN rail feet pre-installed. Select a location on a DIN rail, and snap the module into place starting with the side away from the screwdriver release tabs. The EDT should be installed in a suitable tool-accessible enclosure that is IP54 or higher. The enclosure should suitably protect the equipment from deterioration that would affect its suitability for Class I, Division 2 locations. Additionally, some setups will use the second Modbus port if needed. The Power/Comm block (Pins 1-6) connect to the EIM or next module in the system (e.g. AFRC). If multiple EMIT modules are present, any module in the middle of the chain (i.e. with two harnesses connected to the Power/Comm block) should have the CAN TERM switch off (to inside of module). There are two options for wiring to the ADEM: wiring into the ADEM control panel directly, or using one of two connectors on or near the ADEM control panel. Direct wiring is generally cleaner, but sometimes the terminal blocks in the ADEM panel are full. These options are discussed separately. For an ADEM 4, run a cable from the “ECU CAN” port of the EDT to the “CAN H/L/SHLD” of the ADEM control panel. Typically, the CANH is Yellow and the CANL is Green. The terminal block number of the ADEM CAN wires vary by engine- see the engine schematic if unsure. For an ADEM 3, there will be two cables required. Run the first cable from the “ECU CAN” port of the EDT to the “CAN H/L/SHLD” of the ADEM control panel. Typically, the CANH is Yellow and the CANL is Green. Run the second cable from the “CDL” port of the EDT to the “CDL+/-“ connections in the ADEM panel. (Note: CDL A on the EDT is CDL+ on the ADEM, and CDL B is CDL –). Typically, CDL+ is pink and CDL- is purple in the CAT panel. The terminal block numbers in the CAT panel for the CAN and CDL wires vary by engine- see the engine schematic if unsure. Typically, there is a three pin Deustch connector in the ADEM panel and near the ECU for a CAN connection. The gender of this connector varies by engine so EMIT offers two cable options- both the male and female version. Remove the existing termination connector from the 3-pin splitter and connect the EMIT cable. Run the cable to the “ECU CAN” block on the EDT. 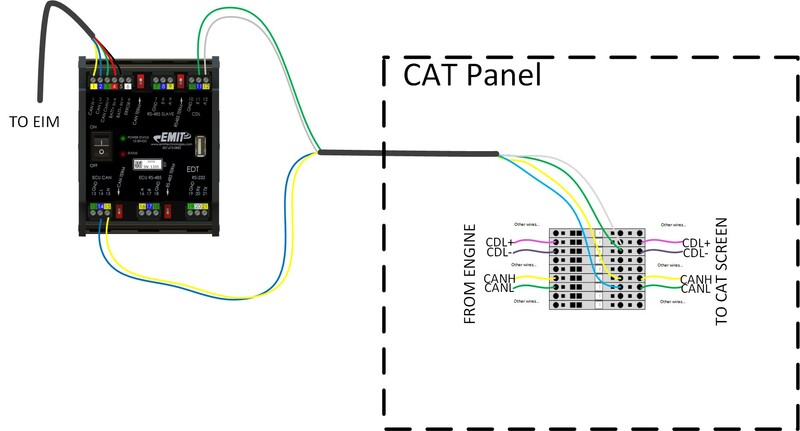 Most CAT panels have a 9-pin diagnostic connector, which might have connections for CDL, CAN, or both. The EMIT 9-pin harness has wires for both CAN and CDL, but some CAT panels won’t have pins in the connector for one of the connections. If the 9-pin connector at the CAT panel has the D/E pins filled, it has a CDL connection. If it has the F/G pins filled, it has a CAN connection. 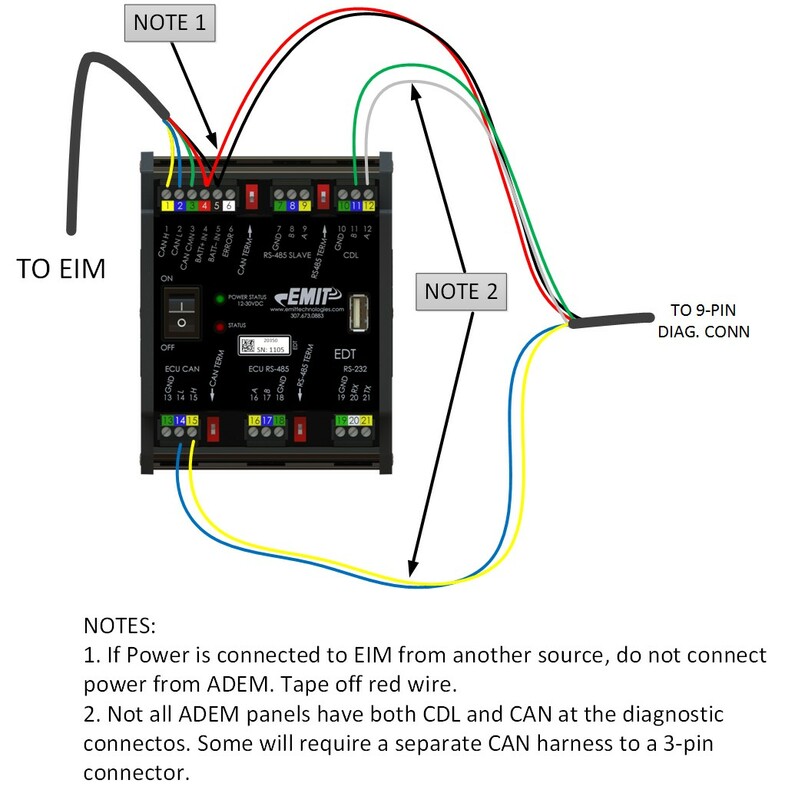 If the diagnostic connector has the CDL connection (pins D/E) but not the CAN connection (F/G), plug the EMIT 9-pin connector into the diagnostic port and wire the CDL cable to the EDT at the CDL port. I most cases, the CAT panel will still have a CAN connection, but it will be on a 3-pin plug. 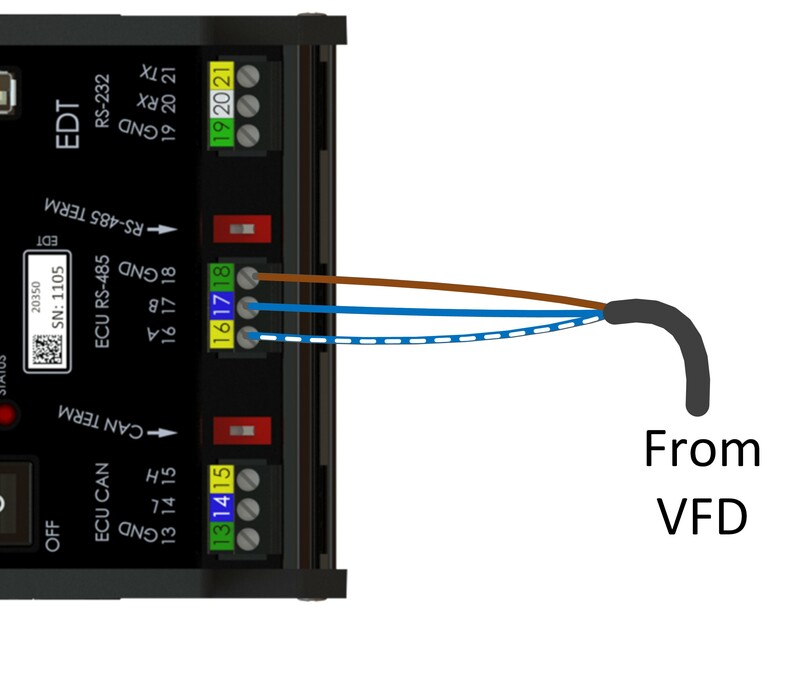 Run a separate 3-pin cable from the ECU CAN port of the EDT to the ADEM panel for this plug. 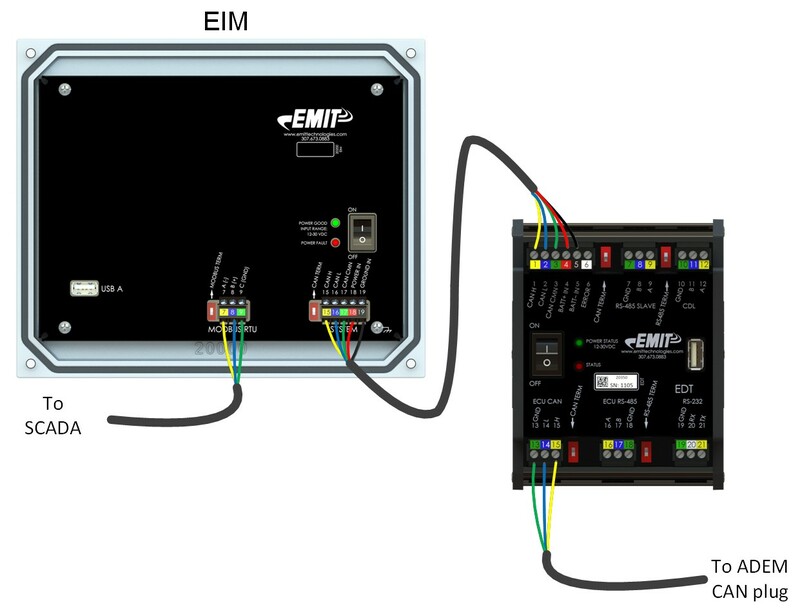 If the diagnostic connector has the CDL connection (pins D/E) and the CAN connection (F/G), plug the EMIT 9-pin connector into the diagnostic port and wire the other end to both the CDL port and the ECU CAN port of the EDT. 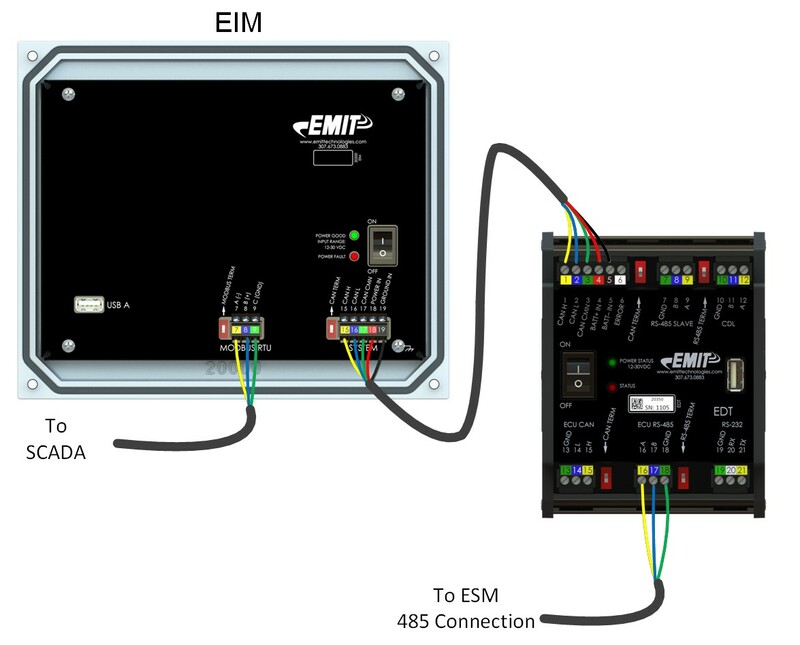 If using the system to connect to an ESM, run a harness from the “ECU RS-485” terminal block on the EDT to the “RS 485A-“ and ”RS 485B+” wires (#1305 and #1306) on the ESM customer interface harness.